"What did you do differently?" W. Crawford asked. "Four things," I said, spearing a forkful of tender, yielding, evanescent flakes. "First, I pinched in the butter." "That's not so unusual," he said. "But this time I pinched carelessly -- leaving rather large chunks! And second, I did use an egg as part of the liquid." "No, I decided it wasn't. It was to compensate for the bread flour, you know? Anyway, eggs are nutritious. Third, I rolled the dough, then folded it in quarters, and rolled it again, just like Aunt L. -- only this time it made real sense because I didn't pinch the butter so small." I picked up a piece of the bottom crust. Glassy-golden, but tender, it had completely resisted the sogginess of the blackberries. "Back in the olden days," I said, "butter was cultured. You'd make butter once you saved up enough cream, and that cream might be pretty cheesy by the time you got to it. That was fine -- it made for awfully savory pastries." "Did you culture some butter?" "Not this time. I calculated that old-fashioned butter was likely somewhat acidic, and helped break down the gluten in flour. And more likely than not, the gluten was already somewhat frayed from standing in the field and germinating partially. Instead, I added a splash of that really nice golden balsamic vinegar in the cupboard." "No, no, no! I'm only compensating for our faulty modern ingredients! Hundreds of years ago when I was an Alpine dairymaid all pie crusts were flaky, tender, and pure as my intentions!" To be entirely honest, W. Crawford never said most of those things. Mostly, he said, "Mmph." But just to prove that I'm not actually cheating -- that I am, in fact, being more "authentic", I think next time I'll use a little whey instead of vinegar. And then nobody can call me a juvenile training-wheels baker. Pbbbbbbt. Using your fingers, briskly pinch 1 lb. butter into the flour. The goal is to have a variety of butter chunks, ranging from little crumbles to marbles, all malleable but not warm. Merely slicing the butter will give you square chunks that won't properly flatten into a billion flaky layers when you go to roll out the dough. Every so often, plunk both hands in the flour and feel out the largest pieces. Quickly rub these between your fingers to make smear-crumbles. The whole process should take just a few minutes, and it's okay if you feel a little slatternly -- soon everything will be in order. Drizzle the egg mixture into the flour, fluffing frequently with a fork, until mostly distributed. Continue drizzling with ice water and fluffing until most of the mixture is in lumps but a fair bit of it is still loose and crumbly. Divide the dough into quarters, pat each quarter into a crumbly ball, cover, and refrigerate for an hour or so. 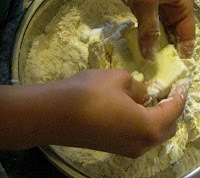 Lightly flour your rolling surface and remove one dough-portion from the fridge. With the rolling pin, pat it down, packing it until it holds together, and roll the dough, from the center outwards, into a 10" disc. Gently fold the dough in half, and then in half again. Re-flour your rolling surface, and roll the dough a second time into a large circle, checking frequently to be sure the dough isn't sticking. Fold the dough in half and transfer it in your pie dish. Unfold it, push it into the corners, and trim any excess hanging more than 1" over the edge. Use the trimmings to patch any thin or torn areas. 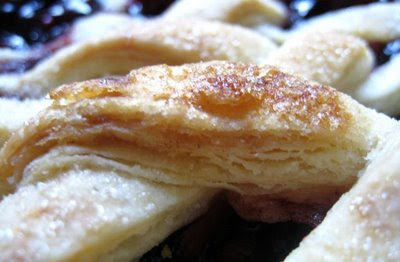 If making a single-crust pie, fold the overhanging rim to lie flush with the dish, press it together, and flute it. If making a double crust, just leave it as-is. Cover the crust loosely and return to the refrigerator. Repeat with the remaining crusts. 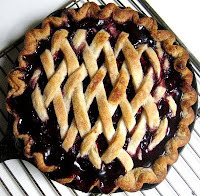 When rolling out the dough for a lattice top, you may find it simpler to fold the dough in thirds, like a letter, before rolling it the second time, since it doesn't need to be circular. Pastry freezes well, so you can line a pie dish, wrap it up well, and stash it in the freezer for another day. Once again I am graced with words of wisdom from my pie crust prophet. Your acolyte awaits the coming of the holy (cook)book of our buttery faith. My soul (stomach) longs for the day when I can make the long pilgrimage to once again worship with you at the altar (oven) of good eating. Oh, for goodness' sake -- I've tasted many a pie at your hands and I dare say I almost miss them as much as I miss you. Let's move back to Virginia and make pie every day. Sounds like a plan. You bring the cast iron and I'll bring the butter. We'll meet to pluck, primp, and pastricize the juiciest of Johnson fruits.